编码： 9781597020107. 分类： Bestsellers, Children's Fiction. 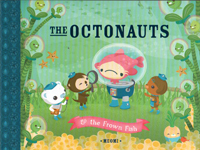 In this sequel, the Octonauts notice the ocean’s shadows are missing! So these eight brave teammates travel to the mysterious Sea of Shade to learn why. Can they convince the proud Shade King to return everyone’s shadows? Find out!